There are some problems that remain from the Standard Model, which string theory hopes to resolve. In trying to figure out the atom’s structure, a natural model for scientists to look to in the past was the planetary model, as shown in this figure. The electrons move around the nucleus in orbits. Physicist Niels Bohr determined that these orbits were governed by the same quantum rules that Max Planck had originally applied in 1900 — that energy had to be transferred in discrete packets. In astronomy, the Earth and sun are attracted to each other by gravity, but because Earth is in motion around the sun, they never come into contact. A similar model could explain why the negative and positive portions of the atom never came into contact. The first planetary model was proposed in 1904 by Nobel Prize-winner Hantaro Nagaoka. It was based on the rings of Saturn and called the Saturnian model. Certain details of the model were disproved by experiment, and Nagaoka abandoned the model in 1908, but Ernest Rutherford revised the concept to create his own planetary model in 1911, which was more consistent with experimental evidence. When atoms emitted electrons, the electron’s energy followed certain precise patterns. Bohr realized in 1913 that this meant Rutherford’s model required some revision. To fit the patterns, he applied the idea that energy was quantized, or bundled together in certain quantities, which allowed for stable orbits (instead of the collapsing orbits predicted by electromagnetism). Each electron could only exist in a certain, precisely defined energy state within its orbit. To go from one orbit to a different orbit required the electron to have enough energy to jump from one energy state to another. Because of the quantum nature of the system, adding half the amount of energy to go from one orbit to another didn’t move the electron halfway between those orbits. The electron remained in the first orbit until it received enough energy to kick it all the way into the higher-energy state. This is yet more of the strange behavior you’ve (hopefully) come to expect from quantum physics. 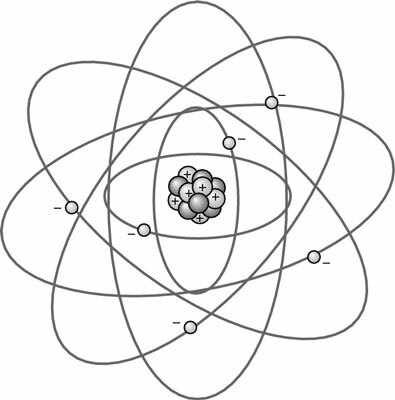 A nucleus is at the center of an atom. Electrons move in orbits around the nucleus. The electron orbits are quantized (they have discrete energy levels) and are governed by the rules of quantum physics (though it would take several years for those rules to become developed).